I love to write novels – and have far too many incomplete or unrevised manuscripts languishing away in drawers. My favourite genre is women’s fiction, both contemporary and historical. I belong to two critique groups and I’m a proud member of the Women’s Fiction Writers Association. I have two completed manuscripts. In the shadow of the Apennines, a work of women’s fiction, has both contemporary and historical storylines. It is set in a region of Italy that I love – in the wild mountains of Abruzzo. 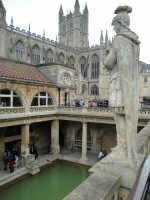 Dark Blue Waves is set in modern-day and early nineteenth century Bath, England. Samantha moves to a mountain home in Abruzzo, Italy, hoping to start a new life after the break-up of her marriage and a failed university career. But her attempts at breaking into the closed mountain community are quickly thwarted when the residents discover Samantha’s snarky blog ridiculing the town and its inhabitants. Shunned and increasingly isolated in her mountain cottage, Samantha seeks solace in the letters and diaries she discovers in her attic, written by a past tenant in her home – a survivor of the devastating 1915 Pescina earthquake. Despite the century that separates the two women, Samantha feels increasingly drawn into Elena’s extraordinary life and discovers startling parallels that allow her to better understand her own. Janet’s dream has come true. On a literature seminar in Bath, England, Janet lives, eats and breathes Jane Austen. Following an accident, Janet gains consciousness – in Regency England. But corsets, embroidery, and the rules of society in England two centuries ago are only theoretical to Janet, and she treads a thin line trying to blend into her new world without being unmasked as the impostor she is. Her new friend, Emma, helps her to learn the ropes. Emma’s brother, the handsome and proud Sir Edward, is less forgiving, and his jealous love interest is intent on discovering the truth about Janet’s past. Even if Janet is able to evade trouble by traveling back to modern Bath, is she really so eager to leave her ‘new’ nineteenth century life behind? I am also working on a collection of short stories about Italian women and expat women living in Italy. Some of these stories have been published and are available online. Serena fled her small town in Abruzzo years ago, and has carved out a life for herself as a university professor in America. 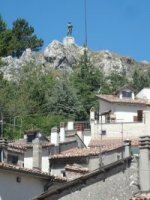 Years later, returning for the first time following the 2009 L’Aquila earthquake, Serena is forced to come to terms with decisions made long ago. Francesca left her native Naples to work in an international organization in Brussels. Recently promoted to a director position, Francesca feels the pressure of espousing progressive gender-sensitive policies in an organization that’s anything but progressive or gender-sensitive. Victoria is an intelligent and driven young woman, at the pinnacle of career success. But her fear of emotional commitments causes her to flee romantic entanglements. On a trip in Bosnia-Herzegovina, Victoria reflects on her past mistakes, and the role she’s played in distancing herself from life. Twice before, Giovanna has been forced to cancel plans for her dream trip to Bali, Indonesia. Years later, Giovanna refuses to change her plans for the third time, despite the consequences. This story is built around a word – the Italian word for close friend or best friend, which translates literally as ‘friend of the heart’. In this story, two women-the sophisticated Roman, Giulia, and the small-town American expat Jamie-meet when they’re fighting over the same man. An unlikely friendship forms, and lasts a lifetime. This is the story of Allison, an American who marries an Italian and moves to Orvieto, a medieval hilltown in Italy’s Umbria region. She’s built a life there working in her husband’s vineyards, until she’s forced to reexamine everything she believed. Laura is a cautious woman who recalls a chance encounter on a long-ago train headed from Florence to Rome. Luciana and Danilo are an Italian couple in a troubled marriage. 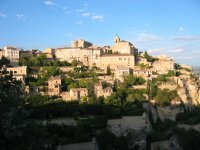 At the urging of their marriage counselor, the couple leave their home in Torino for a holiday in Provence, France. Returning to the place where they first met brings back complicated memories of imperfect choices made long ago. On a pre-wedding vacation in southern Italy, Amanda’s fiancé breaks up with her. 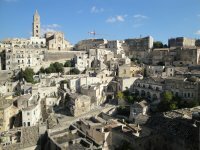 Stranded in Matera, Amanda allows the ancient cave town to work its magic on her. I may not be able to attend, but is it possible to send in submission of my novel? Thanks.